Update, May 3: According to The Investor, Tencent is aiming to invest more than 600 billion Korean won (around $562 million) into PlayerUnknown’s Battlegrounds developer Bluehole, increasing their stake in the company from 5% to 10% and making the Chinese publishers the second largest shareholders. Start training with our PlayerUnknown’s Battlegrounds guide. One of The Investor’s industry sources told them, “since last year, Tencent has been contacting venture capitals that had stakes in Bluehole”. Other big investors including Microsoft were competing for the deal, but Tencent seems more appealing to Bluehole due to their extensive global distribution network. Tencent currently run PUBG in China and are jointly involved with the mobile version. They gained control of 5% of Bluehole in September 2017, and have been looking to increase their stake ever since. Their investments certainly seem to be paying off – their quarterly revenue reports in November showed they’d earned more than EA, Activision, Ubisoft, and 2K combined. 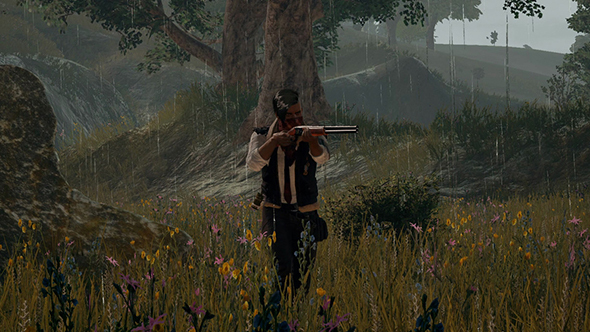 Original story, September 28 2017:Tencent have reportedly been looking at investing in PlayerUnknown’s Battlegrounds developer Bluehole for some time, but suggestions that a deal had gone through were dismissed as mere rumours last month. Though these reports were untrue a month ago, it seems talks have continued to progress, with Tencent owning a 5% stake in Bluehole and seeking much more. A Bloomberg interview yesterday with Bluehole chairman Chang Byung-gyu reveals that Tencent are seeking both a publishing deal and an equity stake in the company. That would seemingly contradict last month’s open-ended statement from Tencent. “Tencent can be a very important partner for us,” says Chang. Today, however, it seems seems Bluehole aren’t quite ready to commit just yet. According to Korean business news source the Investor, Tencent sought a controlling stake in Bluehole, but the Korean developer declined due to their already abundant cash flow. Chang owns 20.4% of Bluehole, with three venture capital firms holding an additional 15% combined. Tencent apparently wants more than the 5% stake they’ve managed to acquire, but purchase offers were declined because of the soaring popularity of Battlegrounds. Bluehole is now valued at $4.6 billion, quintuple its worth just three months ago. “There is a joke within the industry that venture capital firms now can be divided into two groups: those who have Bluehole stake and those who don’t,” the Investor quotes one venture capitalist as saying. Tencent’s attempts to buy in are especially interesting considering that they already own a 40% stake in Epic Games, whose recently released Battle Royale mode for Fortnite has drawn criticism from Bluehole for its similarity to PUBG. In any case, the success of Bluehole and Battlegrounds shows no signs of slowing down. Clicking on links in articles to retailers or publishers may mean we earn a small commission.